Hello Everyone! Jo from Let’s Art Journal here. 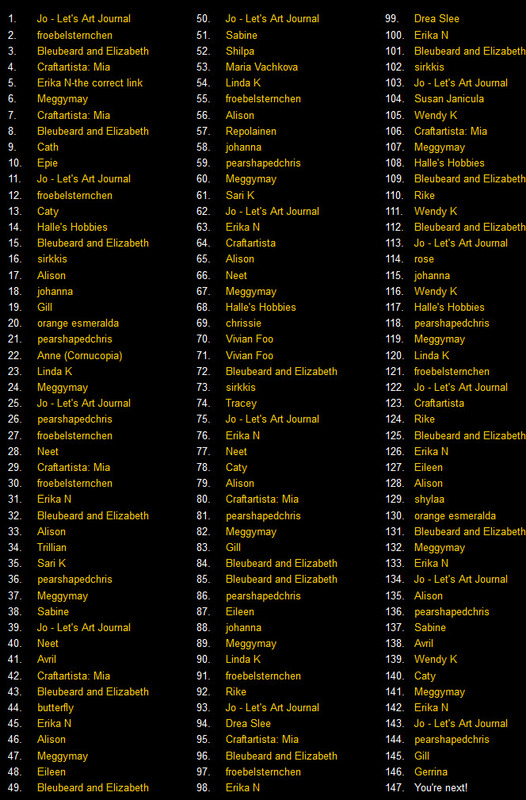 I am so delighted to be hosting Art Journal Journey this month. If you haven’t met me before, I live by the sea in the North West of England with my hubby and I started Art Journaling over 3 years ago as a way of expressing my life through words and pictures. I’m passionate about art journaling and love everything mixed media! Now it’s March, spring is just around the corner so Susi, Bleubeard & Elizabeth and myself would like you to join in and say hello to springtime. 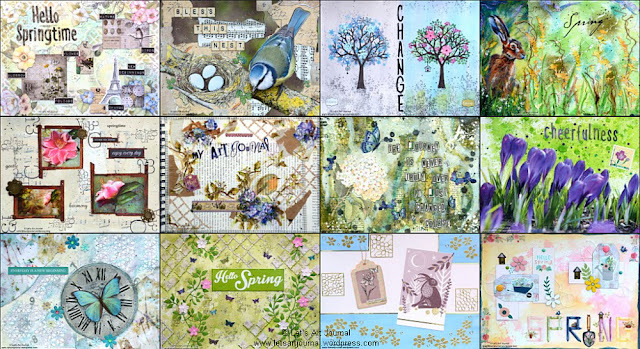 You could include flowers, blossoms, new foliage, birds, birdsong, butterflies or any other nature on your designs or perhaps capture the changes in the season with sunshine and blue skies or even new beginnings as spring is a time of change! The possibilities are endless so I hope that you are inspired by this month’s theme and are able to join in the fun. I am really looking forward to visiting you and seeing all your wonderful springtime creations! And please, as always: Don't forget to take a look at our RULES . Thank you dear Jo for all those wonderful pages! I'm really excited about this theme, Jo. It may not be spring outside, but it is certainly spring on your wonderful journal page. Your page and your theme : BOTH is WONDERFUL Jo! So lovely to see you as the host again Jo and what a super page to ease us into the wonders that await as we approach Spring. I'm so ready for this Season. Thank you for sharing with us all and keeping everything crossed that I can play along with you all this month. Jo comes up with some great journal pages, doesn't she? SO glad you like her theme and we really hope to see you here this month, dear Tracey. What a delightful piece of inspiration. Great theme. I agree, Neet. It's a beautiful page and very inspiring. I hope it inspires you, too. Thank you, that's very kind! I'm so pleased you the theme this month aswell as my art journal page, it was a labour of love as I always enjoy hosting here at AJJ 😁. Creative wishes! Definitely looking forward to taking part in Jo's theme and celebrating the arrival of Spring on the 21st! Brilliant inspiration in this first page! Hugs, Chrisx ps no idea where my first comment went!! I know it won't be long till we see something awesome coming from your craft room, Chris. So glad you like Jo's theme. I think it's wonderful. This is a great theme Jo has chosen and the inspiration page looks fantastic, I am looking forward to joining in soon. I look forward to seeing what you come up with, Yvonne. You are so supportive of AJJ and I know you will make great art using Jo's theme. 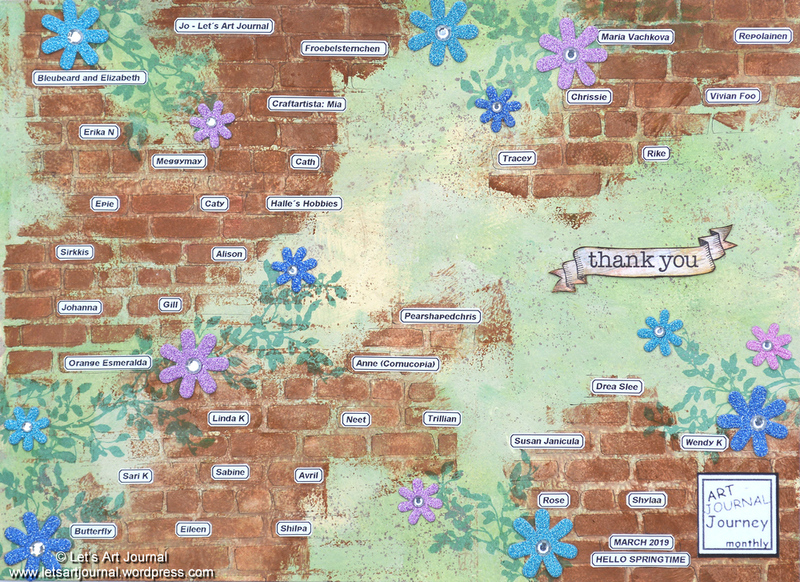 A wonderful theme Jo, and your page is beautiful! Looking forward to joining in. I also look forward to seeing what you come up with this month, Alison. I agree that Jo's journal page (and theme) is certainly inspiring. Spring is a very good topic for March. I love to join you in welcoming the new season. Super wenn Du wieder mitmachst! We look forward to seeing what you have in store for us in this springtime theme. Beautiful inspiring page and a great theme for March Jo.. I am looking forward to see with what you will come up Gill! I agree Gill. Jo's pages are always over the top. Hope to see your first entry soon. Your page is really Gorgeous Jo !! Love this theme full of joy .... and welcoming Spring, just at the corner. Thanks for all the wonderful inspirations !! Yes, spring will soon be here, Caty and I agree that Jo's page is inspiring and beautiful. Great theme and page to kick it off! I'm SOOOO ready for Spring!! I am too, Halle. If only we both weren't buried in drifts of snow right now!!! beautiful page and oh what a welcoming theme Jo!! I agree Linda. This winter has been a killer and I am SO looking forward to this theme actually working to bring us spring weather. Marvellous theme, Jo, and your artwork inspiration is just that - inspiring, with so much to look at. I agree with you, Sheila. Jo pays so much attention to detail, and her art is always inspiring. A lovely theme Jo, and wonderful inspiration. I totally agree Avril, and hope her beautiful art inspires you as it has me. A great theme, Jo, and I'm looking forward to having some time tomorrow to visit some of the springtime joys! We're so glad you found time to join us with your always stunning art, Alison. Keine Ursache liebe Johanna! Danke für's Mitmachen! Delighted to see you posting this month, Johanna. 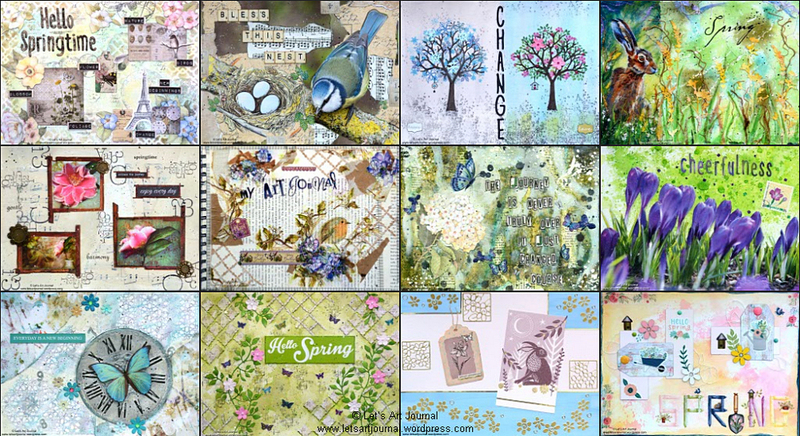 Wonderful theme and your artjournal page is very inspiring, dear Jo! I'm still playing catch-up Rike, so I'll be by soon. Great theme and beautiful spread! I look forward to seeing your art, Drea. I am running far behind due to being without internet for nearly a week. A nice topic where everything begins, thanks! I agree that it's a great topic and one I am delighted you like. Fabulous page to start us off, I'm just a very late starter. And I'm even later visiting!!!!! It's been forever since I've joined you here, and it feels so good to be joining you (all!) 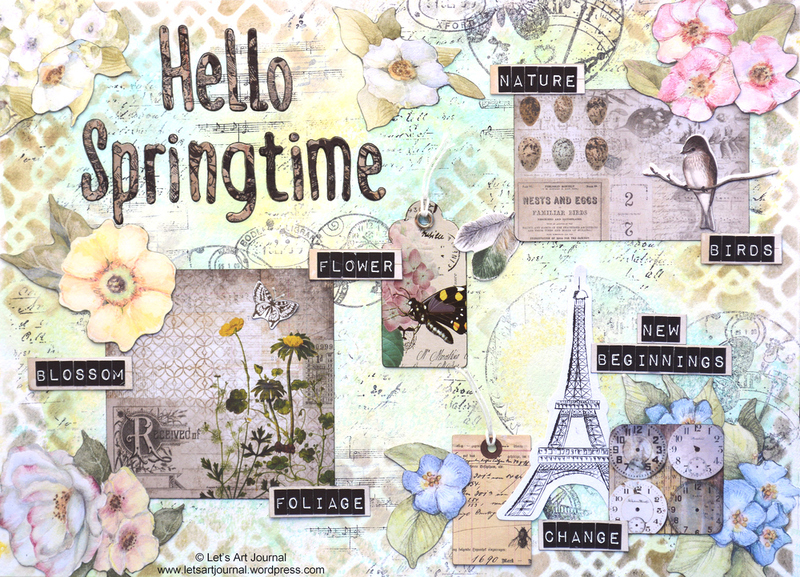 this month in saying hello to springtime!